The 10th Shanghai Cooperation Organization (SCO) heads of governments meeting will take place on November 7 in Saint Petersburg, Russia. The prime minister of Pakistan will participate in the meeting at the invitation of Russian Prime Minister Alexander Putin. The Organization, originally founded in 2001 has evolved into an effective mechanism over the years to enable its member states trans-act on strategic regional issues and economic development. The issues confronting the region are too strategic to be solved by a single country without cooperation from others and hence the need for creation of SCO (originally known as Shanghai five) by China and Russia. The last conference held on the occasion of the 10th anniversary of formation of SCO was at Astana, Kazakhstan on July 15 this year. The declaration issued at the end of the conference included the anti-drug strategy and action plan for the years 2011-2016, procedures and conditions for becoming SCO members and reports on the activities of SCO’s regional anti-terrorist organization during the last year. Since its inception the organization has come a long way wherein it is now given due importance at all regional and international organizations. As it happens with every upcoming organisation it is confronted with many external and internal challenges as well. Externally, its security concepts run counter to that of Nato and the United States. The SCO believes in ‘non-alignment, non-confrontation and non-interference in the affairs of other countries’ by preferring to convince the countries to solve their differences through peaceful means. The United States still relies on its military prowess to realize its own security and as well as that of its allies through military means. The SCO is working towards ending the ‘cold war’ concepts and transcending ideologies unlike the Americans who still follow them. Internally, while China prefers economic cooperation to be the main charter of SCO, Russia prefers SCO to act as a security block in order to meet the security needs of its members arising out of an unstable Afghanistan and global military ambitions of the United States. Over the years the SCO has turned into a regional powerhouse, as the world is fast transforming from a uni-polar to multi-polar world. 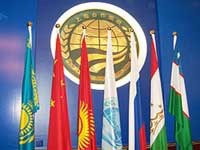 When compared with other regional organizations like Saarc, the SCO has gained more weight in the region. It has opened up to other countries of the region with Pakistan at the forefront to become its member. With Saarc’s limited progress in development of the region and its member countries mainly due to Indian intransigence, hopes from SCO have forced the Pakistani policy makers to alter focus towards the SCO alliance for more close cooperation with Central Asian States. Pakistan had applied for full membership of the SCO in 2006, Iran and India followed suit in 2007 and 2010 respectively. With enlarged number of members the SCO will enable itself to play an effective role in the region sequel to US departure from Afghanistan. Since Afghanistan quagmire can only be solved through a regional arrangement, SCO can be the ideal platform for it will confront an Afghanistan rife with terror and in-fighting between ethnic factions for creating their areas of influences as US reaches its end-time in Afghanistan. The situation in Afghanistan has already started worsening and with US demands for five permanent bases after 2014 in Afghanistan will further aggravate not only the Afghan security situation but also the regional environment. The perception of Central Asian States about Pakistan’s role in confronting the war on terror and extremism is extremely favorable. Most of these states have been appreciative of Pakistan’s role and the sacrifices that it has rendered in checking terrorism and extremism and have assured Pakistan their full support in its quest for a full member status in the SCO. Pakistan on its part also cannot afford to ignore the size, population and markets of Central Asian States for its own development. Energy starved Pakistan stands to gain a lot by becoming a full-fledged member of the grouping. The bilateral investments in the grouping, mainly in the energy sector, have surpassed a huge total of $15 billion. The gas reserves of Russia, Central Asian States and Iran comprise 50% of world’s reserves and the immediate focus of the government is on the energy issue that has virtually stalled Pakistan’s economy. Pakistan being the member of SCO can fully realize the potentials of the organization in connecting Chinese and Central Asian member states with the Gulf countries and South Asia. For the purpose Pakistan has already offered its Gwadar Port and other land routes. Pakistan today is passing through a rough patch in its history as it strives to eliminate non-tolerance, terrorism and extremism from its very fabric. The SCO countries are also victims of terror phenomenon in one form or the other and as such through collective efforts Pakistan can contribute tremendously in organization’s efforts to eradicate these trends that threaten their security. With the incorporation of India and Pakistan, this unique organization will have four nuclear powers (two recognized and two yet to be recognized), a landscape full of energy resources and mineral wealth and accommodating half of the global community; it has all the ingredients to play a powerful role in the world affairs to maintain a balance. The rise of SCO, both as a security group and as an economic entity, reflects the need of the SCO member countries to keep America and the Nato away from interfering in their respective domains without challenging them directly. This can only be done by enlarging the group that includes other important regional countries like Pakistan.